I first met Milton in 1975, at my home in Hillsdale, New Jersey. Shortly afterward I began conducting jam sessions in my home photo studio, and many a great afternoon and evening was spent with incredible percussionists. Milton went on to build a career that spanned several musical genres from salsa to jazz with a strong emphasis on the culture of Santeria, and the music and chants that support this religion. He had an acting part in Paul Simon's "Cape Man" and in recent years had done a great deal of work in world music on a global stage. 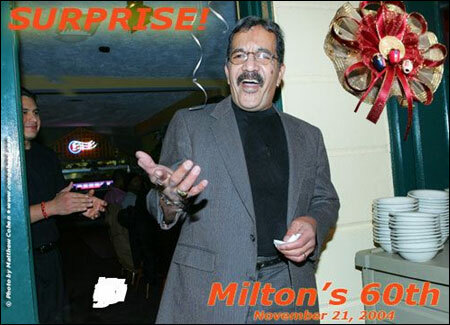 On November 21, 2004 Milton's wife Bruni surprised him for his 60th birthday with a party at Tito Puente's restaurant in City Island, New York. It was great to see so many great musicians and warm people turn out to pay tribute to a great musician and good friend.